Find Cochrane real estate listings & homes for sale. Search Cochrane real estate listings, walk through beautiful parks visit Cochrane area homes for sale, real estate reviews, Agents, REALTORS®, play a game of golf, ice hockey or explore Cochrane condos, townhomes, community events living at its best! New Open Houses, statistics, breaking news videos, quadrant maps or research public schools & local playgrounds. Our Cochrane Real Estate MLS® listings website is designed to be a valuable tool for anyone looking to buy or sell Cochrane real estate. You can view all Cochrane MLS® listings in the various neighbourhoods, search homes for sale, understand how we'll sell your home, learn about building a new home, find a building lot or keep up with the latest information or opinions on Today's Cochrane real estate news blog. Cochrane is a growing and vibrant bedroom community just minutes awat from Calgary's city limits and a 40 Minute commute to Downtown Calgary. With a growing population comes a growing service sector with international retailers like Safeway, Starbucks, and Blockbuster just to name a few. But don't forget home grown favorites like Cochrane Coffee Traders, Guy's Cafe and World Famous McKay's Ice Cream. With incredible proximity to the Rocky Mountains, Banff National Park, Canmore and Kananaskis Country. Local amenities include the Cochrane Library, Spray Lakes Recreation Centre, Cochrane Ranche, Swimming Pool, Hockey Rinks, Curling Rink, The Links of GlenEagles a 18 Hole Championship Golf Course and kilometers of walking and bike paths along the Bow River. 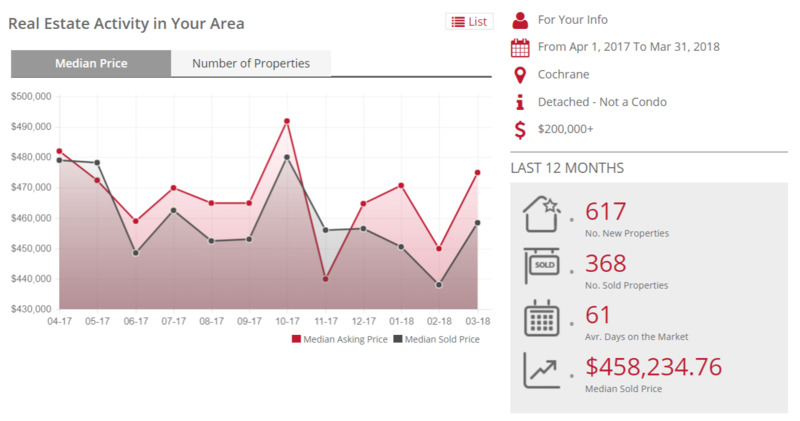 What's My Cochrane Area Home Worth?